100 % Porsche. 100 % you. come true, time after time. taste. A Porsche like no other. Yours. exclusivit y lies in the programme itself. ideas. Right down to the last detail. about the world of Porsche. Sometimes it’s about hundredths of a second. And sometimes it’s about hundredths of a millimetre. 8 · Exclusive examplesFor fuel consumption, CO2 emissions and efficiency class, please refer to page 56/57. the individual colour Grigio Campovolo. Personalised according to your wishes. is superficial. Every thing has its purpose. underline the car’s sporty performance. 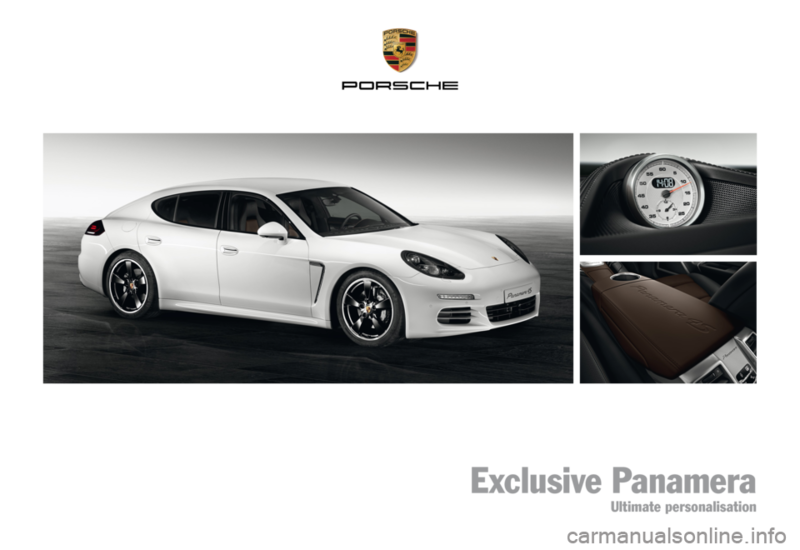 Visit w w w.porsche.com/exclusive to find out ever y thing you need to know about configuring a unique vehicle. According to Porsche – and according to you. will be pleased to fulfil these wishes too. the inner values that are also impressive. these are by no means the only highlights. equally understated, yet elegant contrast. More to discover, under the skin. according to the wishes of its driver. So what do you always get when you build a four seater with us? Thinking in black and white not your thing?